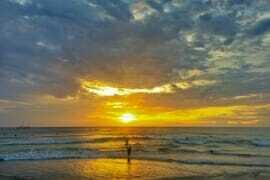 We were finally heading to Corcovado National Park, and I felt the familiar knot of nervous excitement in the pit of my stomach, as we walked in pre-dawn darkness towards the main street of Drake Bay. Bolivar, our guide for the next three days was waiting for us at the tourist office. We already met Bolivar at the pre-departure briefing the night before, and the very necessity of such a briefing made me realize that a visit to Corcovado is not exactly a walk in the park. We discussed the condition of the trails and the available, albeit very limited facilities at Sirena Ranger station, calculated the necessary quantities of provisions we needed to take, and walked through the potential dangers that a visit to a remote wilderness entails. When we arrived at the meeting point at the tourist office, we were greeted with the much-appreciated flavoursome Costa Rican coffee. As we sipped the hot brew, the sky slowly began to lighten and soon a pickup truck came rattling down the road to take us for a short drive to the boat landing. When most of us think about a boat landing site, we imagine a pier or a jetty, but here on the Osa Peninsula the surf is too high for the boats to dock and the only way to get in and out of them is by a beach landing. It sounds like a bit of adventurous fun. That is until you actually attempt to jump onto a constantly moving boat with all your luggage in the surf that rises up to your waist. We did, of course, have some help. The well-practiced locals moved with military-like calm efficiency as they passed our bags to the boat crew, who deposited them in strategic places on the boat. When it came to loading tourists, however, it turned into a slightly less graceful process. There were two main challenges involved: approaching the boat without getting hit by it as it was tossed towards the shore by the waves; and jumping onto the boat while it was at the lowest point of the wave and not tumbling down the rows of seats, as the boat was sharply lifted by the next wave. There were about 12 of us trying to climb onboard and I imagine we provided some welcome comic relief to the residents of Drake Bay who were just starting to emerge from their homes to attend to early morning chores. In the end, we got away with a couple of scraped knees and stubbed toes and somewhat injured dignity. Amazingly, the small boat fit all of us in, as well as the crew, though it was a tight fit. Having successfully climbed onboard, I naively imagined that once we moved away from the shore, the ride would become a lot smoother. But I couldn’t have been more wrong. The captain fired up the engine and the boat burst forward climbing the crests of the waves and then dropping into the troughs with jarring thumps that jolted me out of my seat and pushed the air out of my lungs. There wasn’t much to be done about our discomfort, however. We were now committed to two and a half hours of the bumpy ride. To take my mind off my rattling teeth and sore bum, I looked to the surrounding scenery for distraction. We followed the coastline of the Peninsula that rose out of the ocean in undulating slopes, wrapped in a thick carpet of lush tropical rainforest. Most of the peninsula is protected by Corcovado National Park and the sheer expanse of its wilderness was staggering. Just as I started to desensitize to the bone-rattling tossing of the boat, about 2 hours into the ride, I sensed the mood around me change. With a sense of foreboding, I followed the nervous gazes of people around me and saw a dark mount of jagged rocks menacingly protruding from the sandbar ahead. The water churned around the rocks betraying the strong pull of the current. A couple of locals, who were hitching a ride on the boat, started yelling words of encouragement to the captain. Bolivar turned to us with a goofy grin: “Don’t worry, he is a good captain”. I didn’t even know we were supposed to worry! Until now. Pete gave me and Ruth a reassuring smile that looked like he was trying to convince himself more than anyone else. Meanwhile, the waves grew even larger and the tension in the boat reached its peak, as we came level with the rocks. In order to keep meeting the waves head-on, the captain had to steer the boat directly towards the sandbar, which meant he was risking getting caught in the powerful current that pulled towards the rocks. He revved the engine and the boat started climbing a wave so high, it blocked the rocks out of view completely. 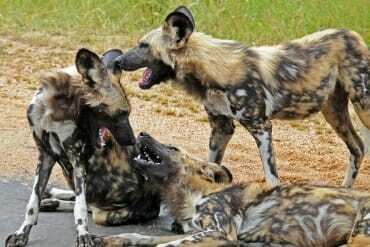 Someone screamed, while most of us held our collective breath and held on to whatever we could with white-knuckled grips. When the boat finally reached the crest of the wave, the captain skilfully turned it around and sent it down in free fall. An agonizing second later it slammed on the surface and immediately started climbing another wave that effortlessly carried us away from the treacherous rocks. Passengers on a plane often like to give a round of applause to the pilot on successful touchdown. I frankly find the notion quite ridiculous. I would have thought that at this point in the evolution of commercial aviation a safe landing is included in the price of a ticket. But having avoided a potential shipwreck in this little rackety tub of a boat, I clapped for the captain with the rest of the passengers, and I meant it from the bottom of my heart. I would’ve given him a hug if it didn’t involve running the risk of being tossed out of the boat by a rogue wave. Once we cleared the rocks the captain steered the boat towards the shore and soon we arrived at the beach that serves as the entry point to Sirena Ranger Station. The beach landing didn’t seem to worry any of us this time. The three of us waded out onto the beach and found a log to sit on while we waited for the boat to be unloaded. As I watched hundreds of Hermit crabs scatter away from underneath our log, I took a moment to appreciate the fact that we were finally in Corcovado. 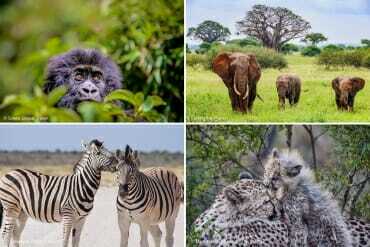 Dubbed by National Geographic as ‘the most biologically intense place on earth in terms of biodiversity’, it protects a dozen major ecosystems that harbour an unparalleled abundance of wildlife. 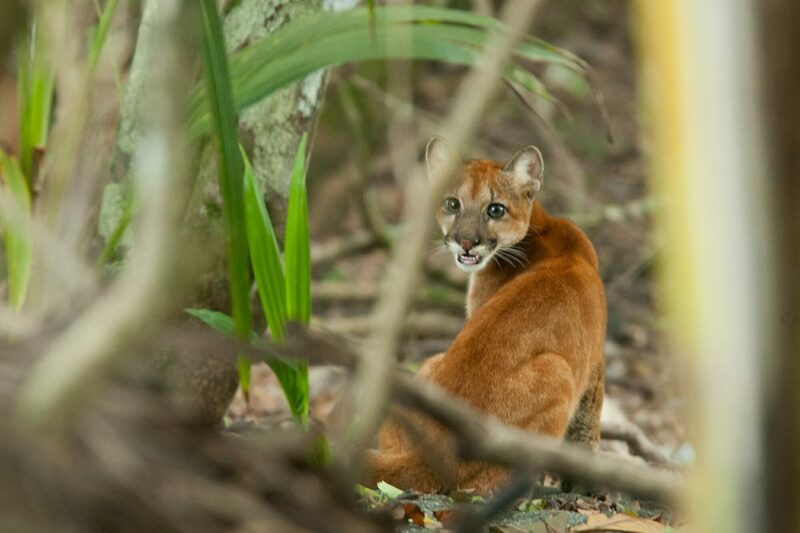 Most importantly, five species of wild cats: jaguars, pumas, ocelots, margays, and jaguarundi prowl these jungles at night. 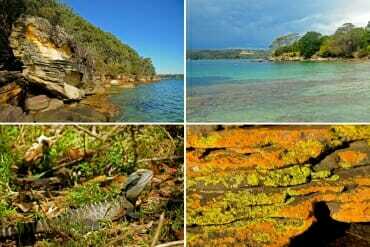 This place is probably, as close to a wildlife haven, as the modern-day planet Earth has to offer. As if to prove my point, within 20 minutes of landing on the beach we were looking at the first endangered species of the trip. Two Baird’s tapirs were taking an afternoon nap in a shady puddle just off the trail that runs from the beach to Sirena Station. We quietly made our way to the edge of their little swamp and sat there watching the odd-looking creatures sleep. 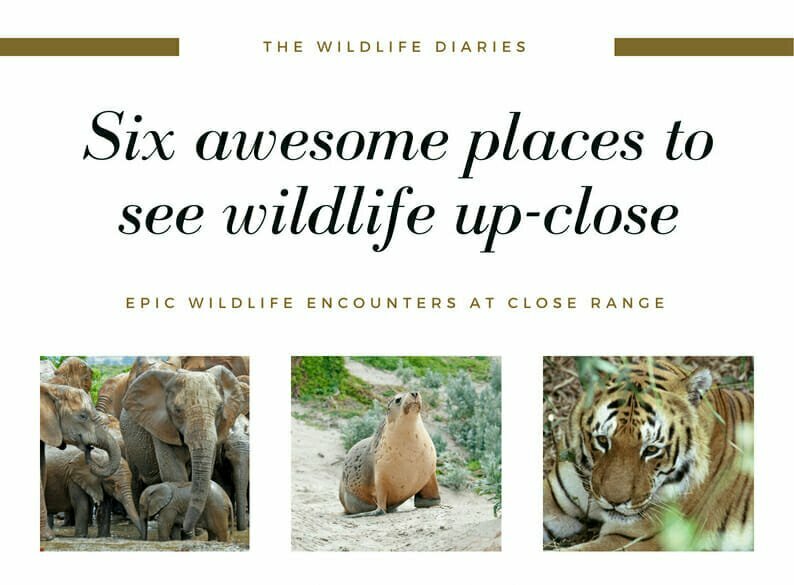 It may not sound like much fun, but it felt incredible to be this close to the wild animals, to be so accepted into their world. We entered Sirena station via the jungle airfield where a cute little 4 seater plane sat parked in the freshly mowed grass. 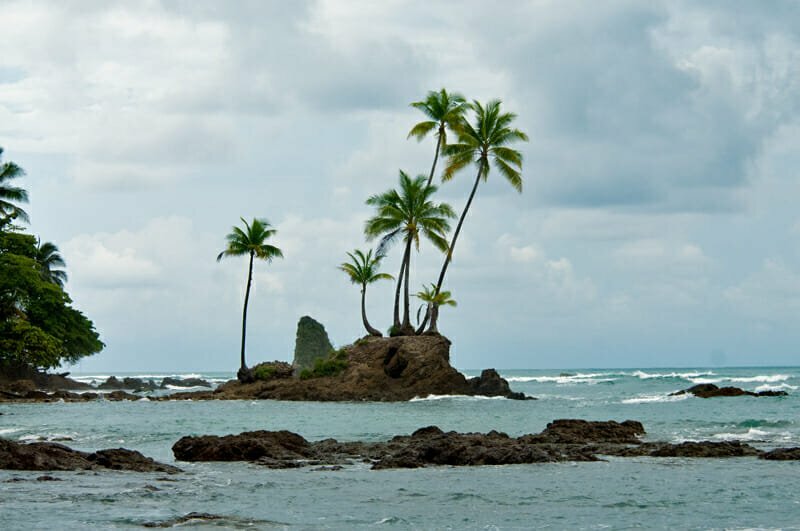 The Station had an idyllic appearance of a tropical research station that brought to mind images from the Jurassic Park movies, which came as no surprise since some of the films were actually filmed in Costa Rica. But behind the romantic façade, hid Sirena’s ugly truth. The facilities were not simply dilapidated but seemed to be intentionally offensive. The only saving grace was the dining area and the wide wrap-around veranda of the ranger’s office. I could easily imagine lazing around after dark in the comfortable chairs on the veranda, watching wildlife emerge from the jungle. But for now, we were content to have a quick cup of coffee and to leave the station to explore one of the trails. 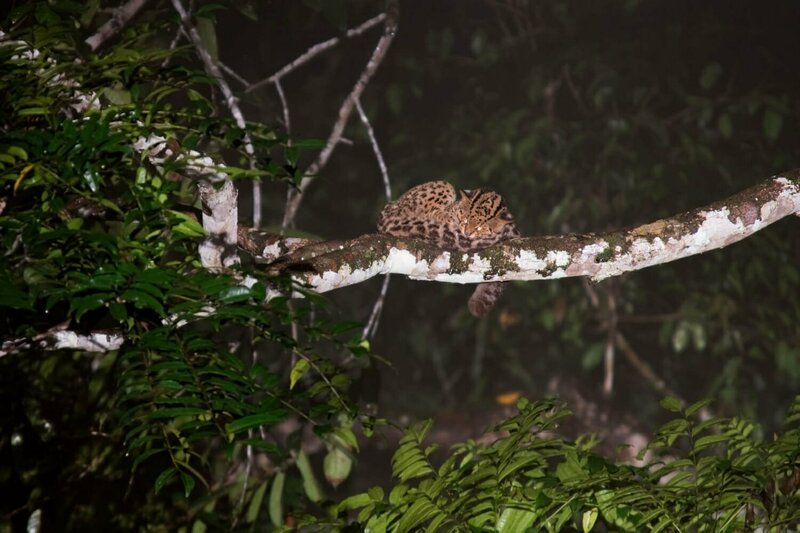 As soon as we stepped from the brightly-lit clearing of the station into the dim unknown of the jungle, we were engulfed into a different world that was absolutely teeming with wildlife. A beautifully-patterned Tiger snake slithered across our path. Exotic birds painted in vivid colors darted through the trees. Collared peccaries and White-nosed coatis scurried in the leaf litter completely unafraid. Up in the trees, Howler monkeys and Squirrel monkeys raced across the canopy, dislodging ripe fruit that would land with a thud at our feet. It seemed like at every turn there was something amazing to look at. 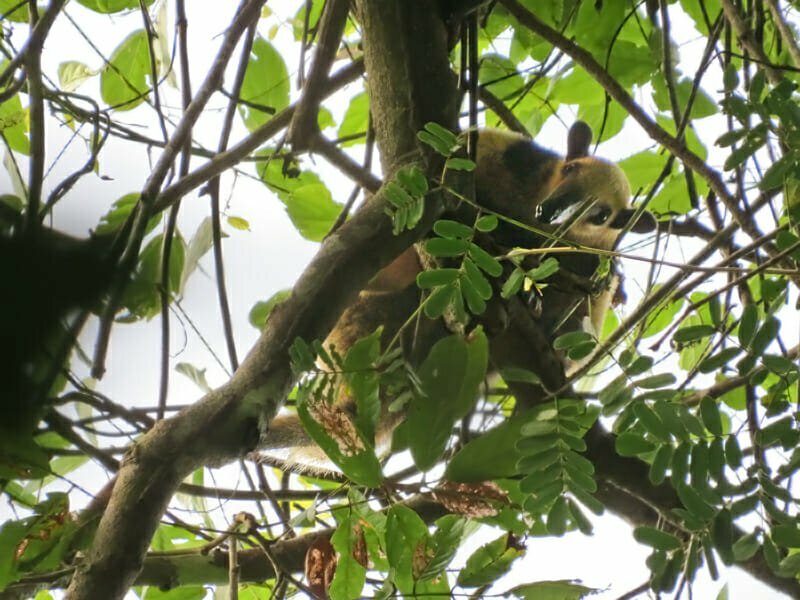 Bolivar spotted a Northern Tamandua – Costa Rica’s largest anteater, high up in the canopy. It seemed to have too ungainly a shape for a tree-dweller, yet it moved with unexpected grace. It poked its curious face through the branches to have a better look at us. Not to be outdone by the high flyers, a little Eyelash viper curled up on a branch by the side of the trail, perfectly camouflaged against the moss-covered bark. Apparently, ‘she’ can be found there any day, frozen motionless for hours, waiting for unwary prey to approach within her striking distance. Our second day in Corcovado National Park started with a 4.30am hike to the Sirena River in hopes of seeing tapirs taking a dip in the ocean. The tapirs appeared to have had an earlier swim that day, but watching the sun rise over Costa Rica’s Jurassic jungle was quite awe inspiring. After an enormous and delicious breakfast back at the station, we set off to Puma Valley. I was desperately hoping to see a wild cat in Costa Rica and Corcovado National Park was my best chance. 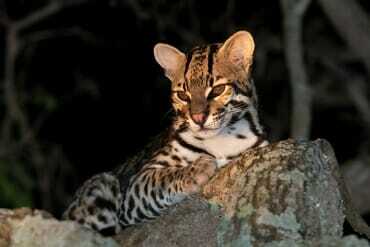 I read reports of ocelot sightings, one even on the airstrip at Sirena in broad daylight, but Bolivar quickly and firmly liberated me from my delusions and assured us that the chances of seeing an Ocelot were next to none. 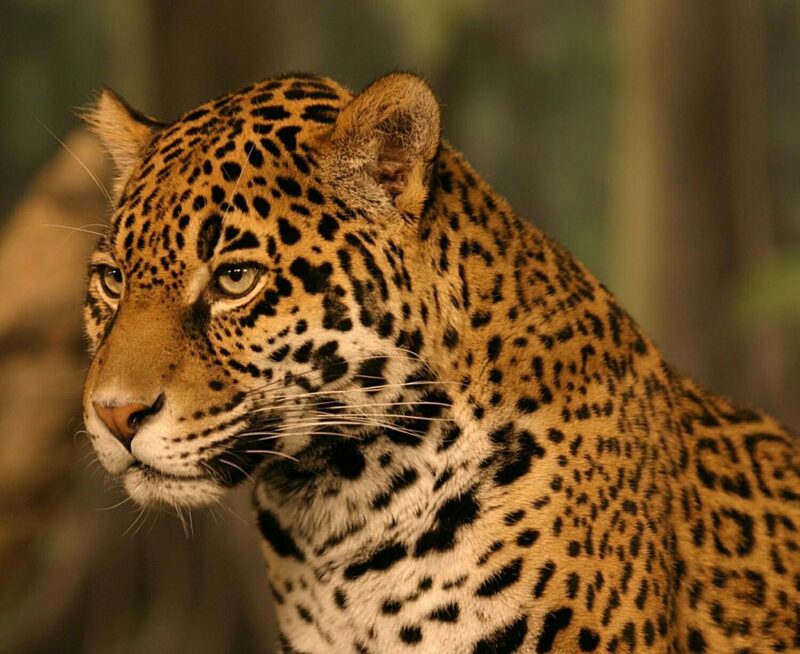 He did see Pumas in Corcovado however, twice, in his however-many years as a guide in the park. 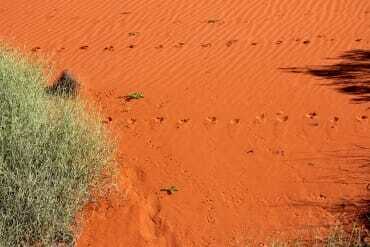 The aptly named Puma Valley was the place where his sightings occurred. The valley lies along the main 16km La Leona track and to get to the start of the trail we had to cross a tidal creek. As we were wading through about a meter of water Ruth pointed at an impressively-sized crocodile floating just below the surface a few meters away. Bolivar’s “Don’t worry they don’t eat people” dismissal of the croc, did not inspire too much confidence. I guess, after living in Australia for a few years you develop a healthy skepticism towards crocodiles’ dietary preferences. The trail to Puma Valley is a spectacular hike. It is flanked by dense tropical jungle on one side and by deserted beaches and the Pacific Ocean on the other. If I was a wild cat, I would’ve been very happy to live here. As soon as we walked into the valley itself, Bolivar grabbed my arm and none too gently pulled me down into a crouch, pointing into the jungle. I looked in the direction he was pointing and met an intent stare of a puma. It was no further than 4 or 5 meters in front of us. Unable to speak or even breathe from excitement, the four of us froze where we were, too afraid that the cat would dash away. It didn’t. And after a while, another little face poked through the undergrowth – a cub! Slowly, they started walking away. Bolivar whispered for us to stay put. 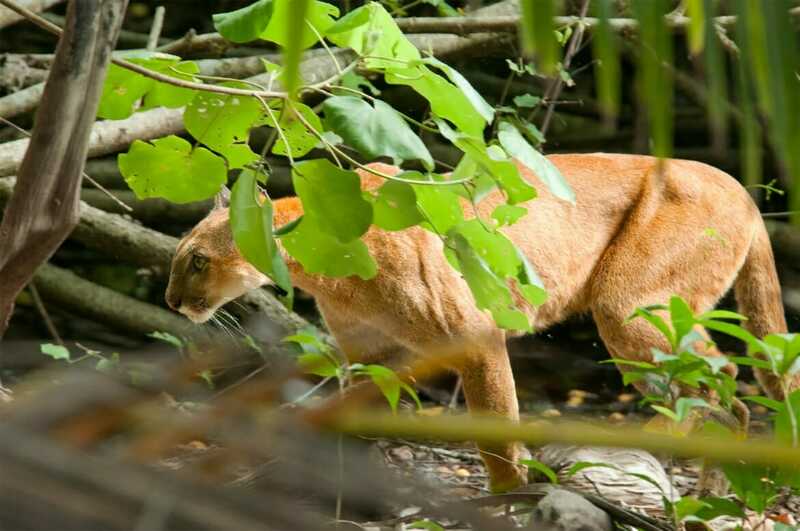 There was a swamp behind the pumas and the only way for them to continue on their journey was to walk around it, right across our field of view. He was right. 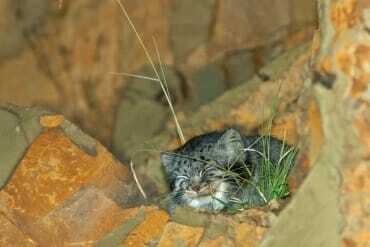 And as the cats emerged from the undergrowth we noticed the second cub. This was just too good to be true. A family of wild pumas in Corcovado! Not running in panic, but walking – the mother leading her young through her domain. This was one of the most incredible wild cat encounters I have ever had. Right up there with being mock-charged by a tiger in India. The rest of our stay in Corcovado paled in comparison to seeing pumas but was still quite incredible. The following day we returned to Puma Valley but didn’t see the cats, of course. But we did find some Baird’s tapirs snoozing in a shady puddle and at one point, a huge group of White-nosed coatis surrounded us on the trail. They completely ignored us as they dug around in the leaf litter looking for buried fungi virtually next to our feet. Before we left the valley we picked up another couple of mammals: a Red Brocket deer and a Red-tailed squirrel, as well as a very impressive Pale-billed woodpecker. Apart from the cats, another animal I wanted to see was a Tent-making bat. 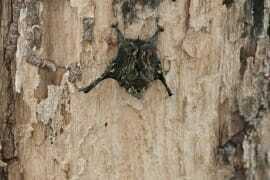 This curious bat builds its own home by biting the central vein of a large banana leaf until it folds in half, forming a V-shaped shelter that protects the bat from the sun and the rain. Bolivar found one near the creek, roosting underneath a large Heliconia leaf. 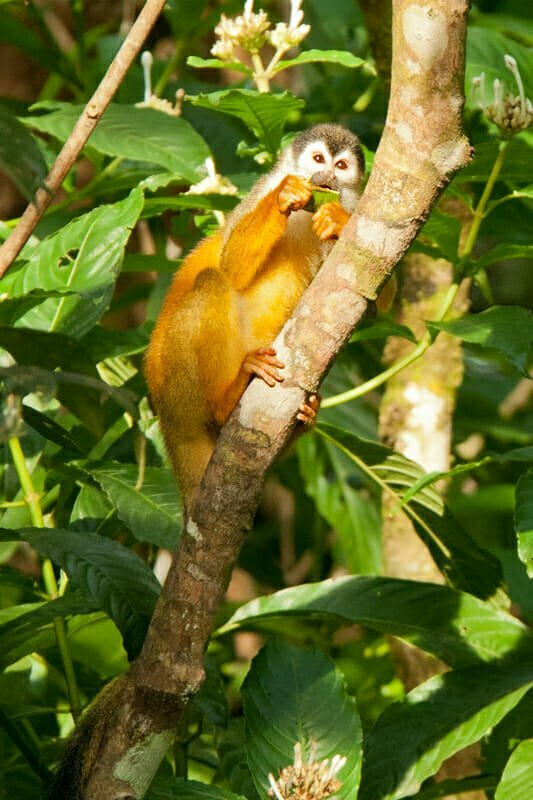 Back at the field center, a troop of Spider monkeys and Squirrel monkeys spent the afternoon squabbling in the low branches, birds of prey actively hunted large insects and Collared peccaries browsed on the grassy lawns. It was like living inside the Costa Rican edition of the Jungle Book. The one thing we kept missing in Costa Rica was Central America’s most infamous poisonous snake – Fer de Lance. 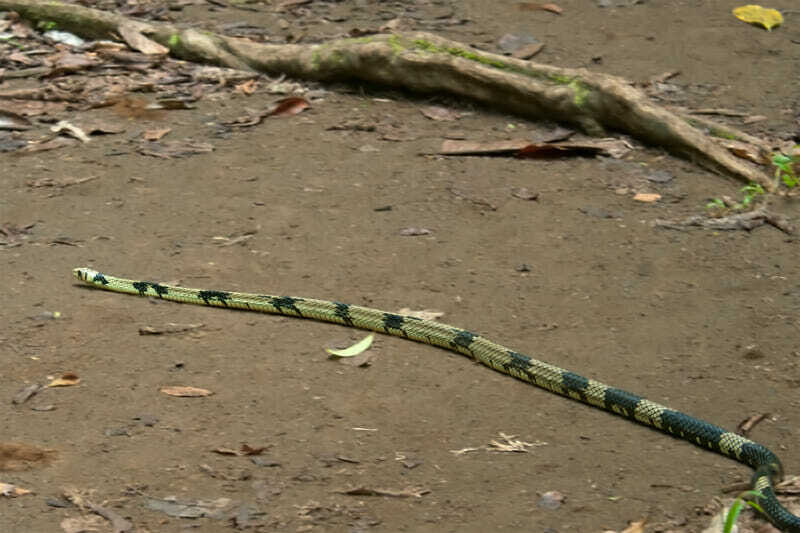 This snake is responsible for most snakebite-related deaths in the region. So when the chance to see one presented itself, we jumped to it. It was the morning of our departure and we were lazing around at the station drinking some much-missed coffee. Suddenly, Bolivar came up brimming with excitement and a sense of urgency. 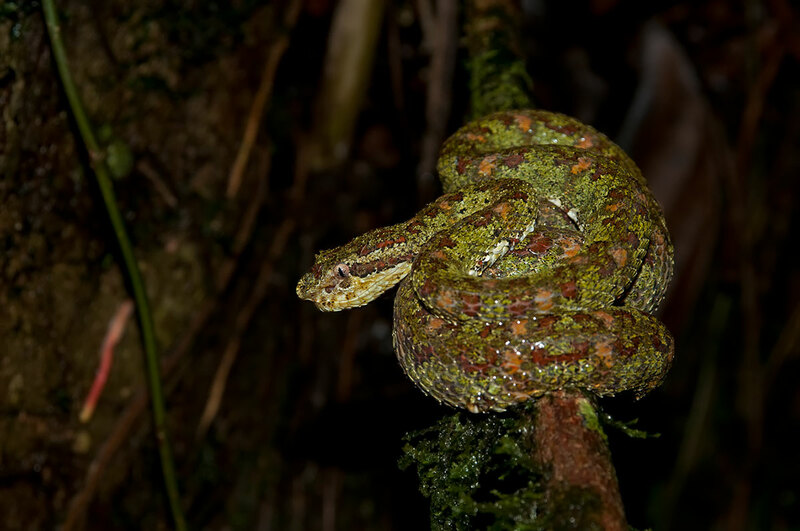 One of the other guides told him that his group just spotted a Fer de Lance about a kilometre up one of the trails. And he offered to take us to the spot. In a flurry of excitement, our coffee was completely forgotten and we took off at a trot after the guide. The trail was so muddy that the flip-flops we happened to be wearing were more of a hindrance than anything else, so we ended up carrying them in our hands instead. This is what wildlife watching holidays are all about for me – running barefoot along a muddy jungle trail to see a venomous snake! The viper, one of the most dangerous animals in Costa Rica, was curled up on the jungle floor barely distinguishable from the leaf litter. It would take real skill to spot it before stepping on it. No wonder the guide volunteered to take us, rather than explain to us where the snake was. He obviously didn’t want to contribute to the count of unaccompanied foreign tourists that perished at Corcovado. 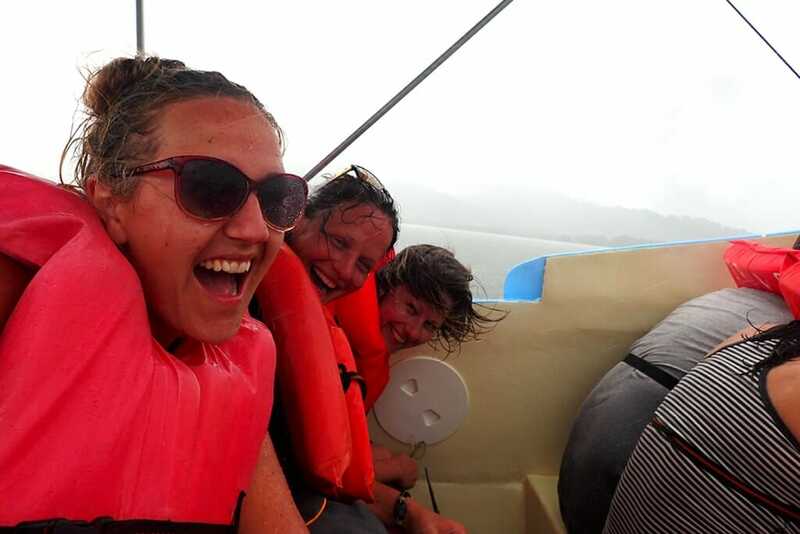 To finish our adventure we were treated to a monsoonal downpour on the boat ride back to Drake Bay. Two hours under torrential rain, all the while thinking that we had our rain jackets packed too deep in our bags, which were stashed out of reach in the stern section of the boat. Remember to keep a rain jacket handy at all times! 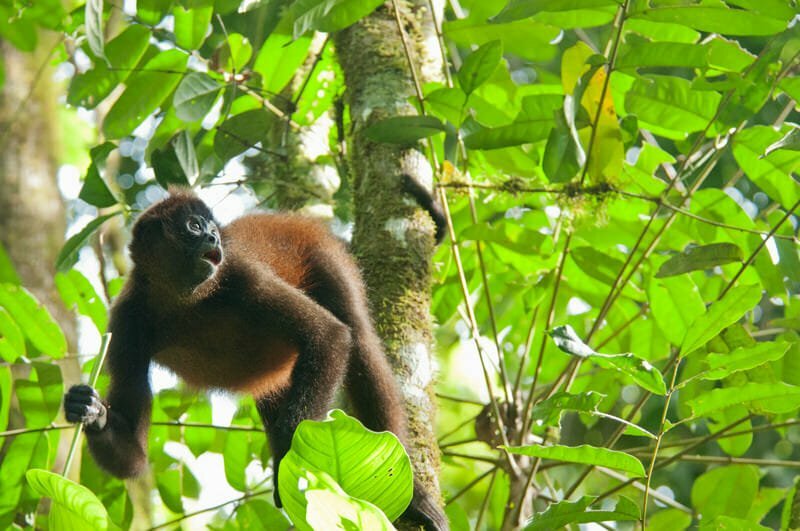 It is compulsory to have a nature guide with you for visiting the remote wilderness of Corcovado. The access point for Corcovado is the small laid-back town of Drake Bay. 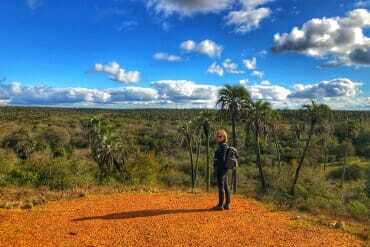 We visited the National Park with Surcos Tours for 3 days and 3 nights. Bolivar was a fantastic guide and without his help, we would not have spotted half of the animals we’ve seen. 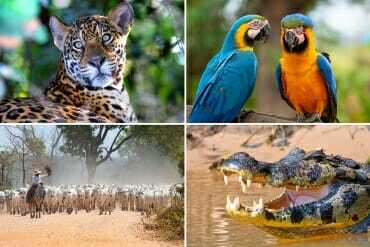 And while the wildlife is very approachable, you could even say tame, in Corcovado, we never approached the animals too closely. Unless they came to us themselves. We also made sure to leave no traces of our visit to the park’s trails and took all our rubbish back with us. Be prepared to rough it a little — the accommodation in the park is very basic. 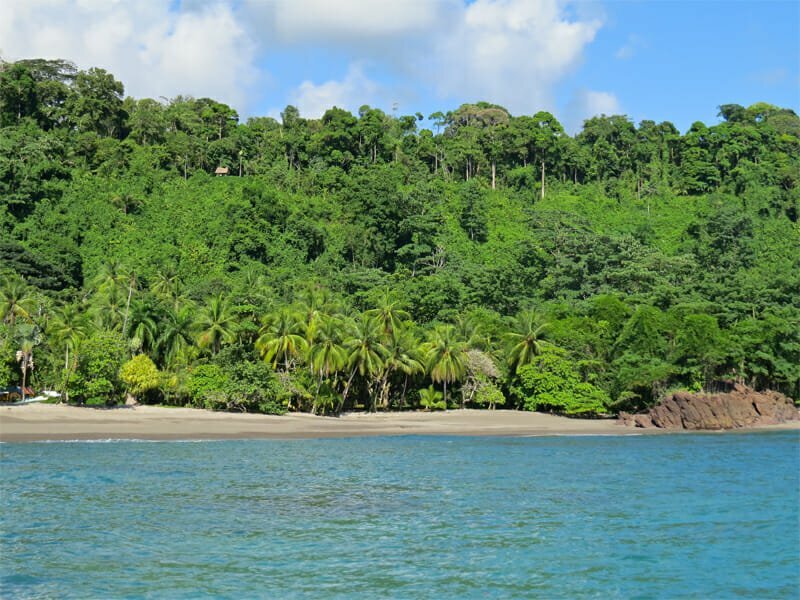 The best part of Corcovado National Park that is open to visitors is Sirena Rangers Station. There are two ways to get to Sirena: by a day-long hike from Puerto Jiminez, or by a two-hour boat ride from Drake Bay. Carrying our backpacks for 8 hours in the humid heat of the tropics sounded like a tough gig, so we opted for the boat ride option. Thank you for your kind words, Mohana. What an incredible experience!! I visited Corcovado National Park a couple of years ago and we spotted an incredible amount of wildlife too, but not pumas, or a jaguar (which would have been incredible!). We did see a baby Ocelot though, and over 100 different bird species. It was a truly incredible trip! Your post has me wanting to go back! A baby Ocelot!? This sounds incredible! I read one report of an Ocelot sighting at the airfield at Sirena Station. 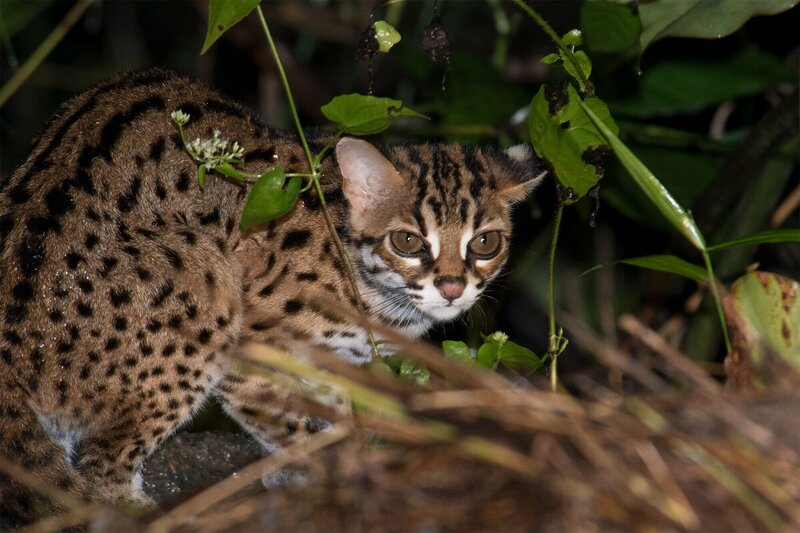 While we were there, we bumped into some rangers at Sirena (they spend 21 days in the forest on a single shift) and they said they almost never see Ocelots. Where about did you spot yours? This is just amazing! Corcovado was on our planned itinerary for Central America, but eventually, we changed our plans and didn’t visit Costa Rica! 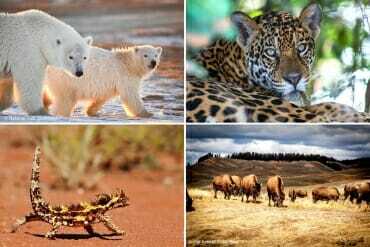 I still want to go there and this National Park is on our wish list… Seeing wild cats would be such a big treat, but I wouldn’t be to eager to encounter all the creepy crawlies (read: spiders!)! You captured the cubs and the other wildlife so well! Love your pictures! 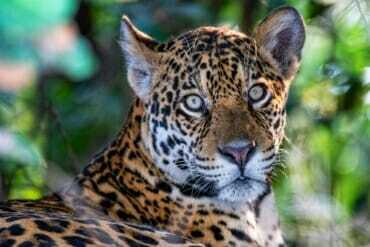 Costa Rica is amazing for wildlife, Kate. 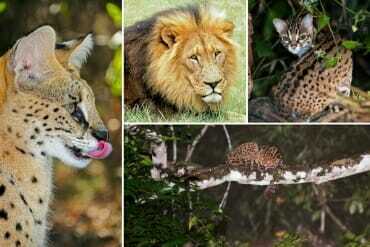 You would love it if you enjoy wildlife spotting. It is such a small country and there is so much packed into that small area – it’s absolutely incredible. A friend and I are trying to plan a trip to Costa Rica right now, and I hadn’t seen this park listed on alot of itineraries, but I definitely want to see if we can squeeze it in now! It’s a bit of a hidden gem because it is so remote. It is absolutely worth all the trouble getting to it if you enjoy seeing wildlife in its natural habitat. Great post and amazing photos. Made me want to go to Costa Rica immediately. Not sure that I want to wade in a tidal stream with a crocodile, though. Lol, the crocs in Costa Rica are much smaller their Australian cousins. The locals seem to have no fear of them. Holy Corcovado looks like an amazing adventure! I’m not a fan of boats and your boat ride sounds somewhat terrifying (and entertaining when you relay it back!) so guess it will be an all day hike in for me … I think it would be worth it for the incredible wildlife, the pumas look absolutely stunning and I’d love to see tapirs too. Absolutely! Whichever way you choose to get to Corcovado, the park will be the highlight of your Costa Rica trip! One of the best places I’ve visited in Costa Rica so long ago (and took me ages to get there). It’s just a hidden gem that not too many people make the effort to visit, which is a shame. You were lucky – lots of great photos of the animals! Wonderful post! 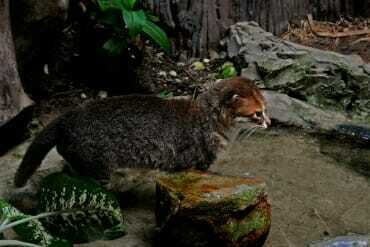 Where to see wild cats in Borneo?